Gay Su Pinnell is a professor in the School of Teaching and Learning at The Ohio State University. She has extensive experience in classroom teaching and field-based research, and in developing comprehensive approaches to literacy education. She has received the International Reading Association's Albert J. Harris Award for research and the Charles A. Dana Foundation Award for her contributions to the field of education. She is also a member of the Reading Hall of Fame. Together with Irene Fountas she has authored numerous books, videos, and websites with Heinemann that are considered standards in the field of literacy instruction and staff development. Their latest innovations are The Fountas & Pinnell Leveled Literacy Intervention and The Fountas & Pinnell Benchmark Assessment System, a comprehensive assessment system for grades K - 8. 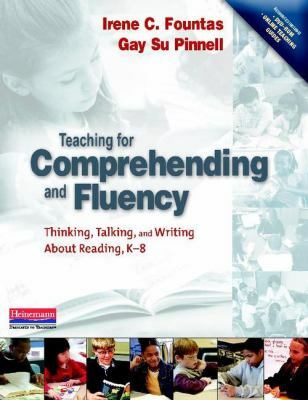 Visit http://www.fountasandpinnellleveledliteracyintervention.com/and http://www.fountasandpinnellbenchmarkassessment.com for detaGay Su Pinnell is the author of 'Teaching for Comprehending and Fluency: Thinking, Talking, and Writing About Reading, K-8', published 2006 under ISBN 9780325003085 and ISBN 0325003084. Loading marketplace prices 46 copies from $5.81 How does the rental process work?